While I may be Mr. Reed (the monster librarian), I know in my hearts of hearts that I'm Miss Wiggle, the crossing guard. I was so excited for this release, Monsters Love Colours is a favorite...then what a letdown. No fun rhythm, no fun guessing questions...darnit. I was so ready to love it. I wasn't crazy about this one. I suppose it could be used as a fun way to introduce Pre-school/Kindergarten aged students to the various parts of a school day that they have to look forward to (art class, spelling, library, etc.) but even some of that would likely go over their heads and not yet be relevant. For example, there is a part about the monsters going to history class, which children of that age level certainly wouldn't understand yet. A great book for a child scared to go to school (or even preschool). It helps them make sense of all the new stuff. Solid and amusing back to school book -- I think it would be fun to read aloud for preschool/gradeschool -- lots of good opportunities for silly sounds. Exuberantly illustrated story about a monster who is nervous about starting school. My boys, ages 4 and 6, adore this silly, positive and creative book, and I love the graphics/illustrations!! This book also does great at mentioning normal feelings of anxiety at trying something new and handles it without shaming or stigma. I love it! The artist use his favorite monster pencils, monster crayons, monster ink and brushes, a scanner and Adobe Photoshop to create the illustration of this book. This book is about the adventure in starting school. Little blue monster is scared but as his first day goes on he enjoys it because he learns knew things. The illustrations and the way the text is display makes it more interesting and energetic to read. I think this would be a great start to welcome student back from there summer vacations and to look forward to a new educational year. Mama read this to me the other night. I love Monsters Love Colors, and this book is great too. Review originally posted on Children's AtheneumSummer is over and we all know what that means--Monster School! As the monsters start their first day of school there is a lot of fear and apprehension, but that all goes away quickly as the monsters begin to have fun.Another back to school book that tries so hard to be different and yet is boring same. I can't believe I am saying this about a picture book, but there were times where I was actually confused as to who was talking and which monster was supposed to be the one that was scared. I am still not entirely sure if it was all of them, or just the green one. Or the blue one. The story itself was a bit ho hum as all the monsters do at this school is rather normal stuff. If this is Monster School then I feel like there is so much more that the author could have done with this story. I know that there are so many of these stories out there, but it is for that reason that making a story like Chu's First Day of School or Planet Kindergarten work so much better. This was an okay book. The illustrations were bright and colorful. The story wasn't exceptional by any stretch of the imagination, but it was cute. It's a good book for kids who are just starting school or starting at a new school. It shows all the wonderful things they will get to learn and do in school. And teaches them that they will make new friends as well.Overall a decent read, but nothing spectacular. My daughter liked the bright colored monsters though. They were very reminiscent of "Monsters Inc". Austin, Mike. (2014). Monsters Love School. New York: Harper Collins Publishers.Picture Book SoakThis book is about a monster who is starting his first day of schools and is very nervous. The story takes readers through the monster's first day and what he learned and what he experienced. This book has illustrations that would be very appealing to young readers and different sized text to catch their attention.This book could be used as an introduction at the beginning of the year for young students. The teacher could read the book and then have students discuss what their fears may be for the school year.I really enjoyed this book because it was so entertaining. It is something children can relate to would enjoy reading. Monsters that love going to school, monsters that don't.Monsters scared, monsters that aren't.Bright and cheery monsters and dull ones.Monsters teachers that talk about space, monster history and what not!This book had them all. My 5-year old kindergartner loved it and wanted to read it again and again. She laughed most of the time and could relate to most of the things going on there. So the harsh reviewers here may need to try to look at this from a child's eyes - the excitement, the nervousness and the charm of going to a new school, making new friends, meeting new teachers and all the drama.We loved it and will be reading more from the author. Monsters Love School is about a monster being nervous about the first day of school. This book would be wonderful to read to kindergartners all the way up to second graders on their first day of school. It would help show those students that are nervous that everything will be okay and that they will love school. I really enjoyed this book because there are many opportunities to ask questions to the class. Also all the illustrations grab the reader with the use of all the bright colors and silly monsters. The language is acceptable and there is great use of onomatopoeia. Summer is over, and it's time to go to school. All the monsters are excited except Blue, who has a lot of questions and worries about this new adventure. But as he goes through his first day, he learns that school is about more than ABC and 123. It's also about having fun and meeting new friends.While the plot is nothing that hasn't been addressed in pretty much every other first-day-of-school book, Austin's illustrations are eye-catching and entertaining, and the book does have a fun, optimistic feel to it. All in all a nice addition to a first-day-of-school collection. This may be a good book to read on the first day of the school especially in a kindergarten class where you may have many first time students that maybe sad or scared. This book can help show how fun school is and what to expect for school. I would have the kids help me brainstorm a list of things we learn in each subject from the information the book gives us about each subject. Austin, M. (2014). Monsters love school. New York: HarperCollins. Cute! A monster nervous about school is relieved to have a great first day. The story is generic enough to work for nearly any school setting, though some of the classes are a bit of a reach for the average kindergartener (history?). There is some side dialog that can easily be skipped to make for a shorter read. A great choice for kids that are mostly excited and only a little bit nervous about the first day of school. Summer fun is ending and all the little monster head to school. Most are excited to see their friends-- “Oh Yeah! Monster School! !” But one little blue monster is worried: “School?! Gulp.” He is sure that he already knows his “ABGs and 413s and XYDs,” so why does he need to go to school? Austin’s playful monsters are sure to bring laughs, with their bright colors and goofy shapes. A great book to ease your little monster’s worries. I picked this up at the library for my daughters (ages 5 and 7). I was drawn by the bright colors. The youngest likes Monsters Inc so I thought she might like it. The art was quite good and my daughters paged through it before bedtime (they are emerging readers). I was a little disappointed in the story though. It follows blue monster on his first day of school. Our family is a homeschooling family and this book is about leaving home and going to school. Monsters Live Colors was cool and if you're kiddo is going to school (or you have a kinder or first grade classroom) this, Monsters Love School, is a neat book to check out. It is all about the supplies and no need to worry. School is a new experience, but it will be fun! Thanks to HC. It was fun to make character connections with this book. It will make a great companion book to The Night Before Kindergarten. Our younger friends will enjoy this book! 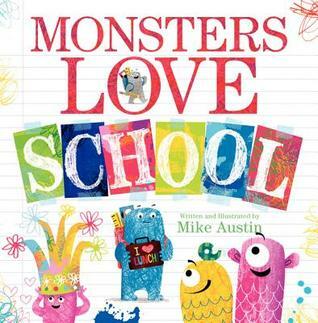 Monsters Love School by Mike Austin – I enjoyed and chuckled my way through this book about a little monster who is scared to go to school for the first time. Quite an entertaining story. Great illustrations. What a fun book to read to get ready for first day of preschool or kindergarten, especially if your kiddo loves monsters, bright colors and fun drawings. I look forward to reading more from this author, whom I jealous of as he lives in Hawaii! Monsters love colors is much better! Good pictures. The story was a little boring (though it could be good for children who haven't gone to school before). Didn't have the same rhythm as Monsters Love Colors but my little boy still liked it. Such a cute book to use in school - would work great as a first-week of school read-aloud! Fun, bright pictures and a cute story.